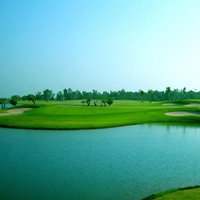 Rachakram Golf Club is a newly opened course in the Bangsai area of Ayutthaya province north of Bangkok. Ratchakram features a great layout offering a tremendous variety of memorable holes. Greens are quite firm and fast, but receptive to holding approach shots, even with long irons and/or woods. In addition to superb greens, the bunker sand is of a nice firm texture, providing the ability to put good spin on bunker shots. The fairways provide excellent lies and are generous with young trees lining most. Now they do not present much of a problem, but naturally they will in future years, enhancing the challenge of Rachakram Golf Club. Designed like a links course there are the undulations and openness in front of the greens enabling shots to run up to the greens on a number of the holes. This course has a great variety of holes both in length and design. The pars 3’s are challenging with lengths of 193, 230, 206 and one short one of 136 yards. The par 5’s all measure over 500 yards and with the wind against you at times; these par holes can play like well over 600 yards!